The council’s plans for Northcote Road will be going before the Regeneration and Community Safety Overview and Scrutiny Committee early next week. They are the end of a process that was started before the recession started to bite, but now times are getting harder the recommendations will really help traders. 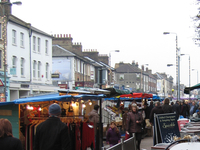 The basic thrust is to help local traders by working with them to increase footfall on the road. One of the key thrusts will be the expansion of the current market and the introduction of specialist markets on Sundays. Additionally the road will see more special events and the council will work at providing extra promotion of the street. One innovation will the be introduction of business ‘succession’ planning. It has been a major concern on Northcote Road that when independent shops close they are replaced by chains – so far the new shops have tended to be sympathetic to the nature of Northcote Road and a good fit for the local demographic, but there is no guarantee this will continue and we won’t see a blight of mobile phone shops there. The idea is that independent traders who are starting to think about retirement can work with the council and possible successors in order to retain the shop as an independent rather than selling the unit or the lease and leaving succession to the luck of the draw. The next step is getting funding for all these schemes – which is likely to be trickier in the recession since the calls on business support will be getting louder – but together the proposals represent a strong start in keeping Northcote Road one of London’s special places. You can read more, and see what else the committee will be considering, on the from the agenda on the council’s website.